We often talk about the father absence crisis in America. Beyond the statistics, are real stories of real leaders who step up and lead a group of dads in their community. Jeremey Simerson is one such leader in Charles City, Iowa. 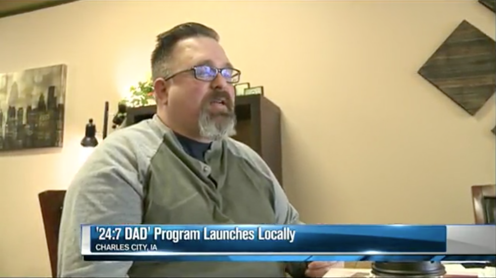 He is launching 24/7 Dad® in Iowa and as Levi Ismail, writing for KIMT News 3, explains, "Being a father is a 24/7 responsibility, but that doesn’t mean you can’t ask for help." Simerson's group meets once a week and helps expecting and veteran fathers share their experiences of fatherhood. Simerson points out that these classes are an opportunity for men to share with one another and talk about how to discipline, how to communicate and how to be involved in their kids’ lives. “Men don’t often sit around and talk about how they feel, but I guarantee you they have fears, worries and questions about how to be a good parent to the child...” says Simerson. Simerson is a social worker see first-hand the households he visits, where there is often no father figure present. He sees the statistics we talk about daily, the 23.6 percent of children who live in a father-absent home. Watch the full news story from KIMT News 3. As I watched the video, I'm reminded how many of our readers struggle to recruit dads into programs. Watching Simerson, he's doing several things well. We call them recruitment "must haves". We've talked in more detail about recruiting in a post called How to Get Fathers in The Door. But, here are a few great tips for recruiting we see Simerson doing in this video interview. Must-Have #1: Passionate program director > Jeremey explains in the interview how he grew up with an involved dad, but he understands that many homes around him don't have involved dads. Must-Have #2: Strategy to deliver program/services where fathers are. The news story points out that there is no cost to attend these sessions and all fathers receive a free fathering handbook. Think location and accessibility of the program meeting here. Dads should be able to attend no matter their transportation situation. Must-Have #3: Create an effective hook > It's not usually the fatherhood program itself that gets dads in the door. Most dads enroll in a fatherhood program because it helps them address their immediate needs (e.g. job training and placement, access and visitation with their children, getting a GED, etc.). In this case, Simerson is offering dads an unbiased and non-judgemental place to come talk about being a dad. Must-Have #4: Program sessions scheduled at convenient times for fathers to attend > My guess is that Simerson may or may not have something he needs to do on Tuesday's at 6:30pm. But, this fatherhood group meets every Tuesday at 6:30 p.m. at the Trinity United Methodist Church. I'm fairly certain he picked this time out of convenience for the dads he's seeking to help. Must-Have #5: Implement multiple marketing tactics > Watch closely as Simerson points in the video to our Shareable Father Facts 7 Statistics. He is using messaging that motivates fathers and addresses misconceptions dads may have about seeking help. Lastly, Simerson is a credible spokesperson as he seems caring and approachable on video. He was also able to be interviewed by his local news station, so he's clearly working multiple media angles. We need more leaders like Simerson working in every community and we can all combat the father absence crisis. Visit our FatherSource Locator to find a local individual or group in or around your city who cares about fatherhood. Ready to start today? 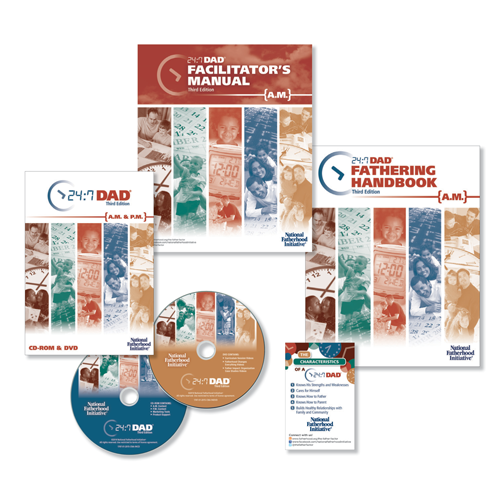 24/7 Dad®, our flagship fatherhood curriculum is used by thousands of organizations and individual leaders across the country to train fathers to be involved, responsible, and committed 24 hours a day, 7 days a week. Visit our 24/7 Dad® Program page to learn more.